The first rule of Burger Club: Burgers are made of beef. 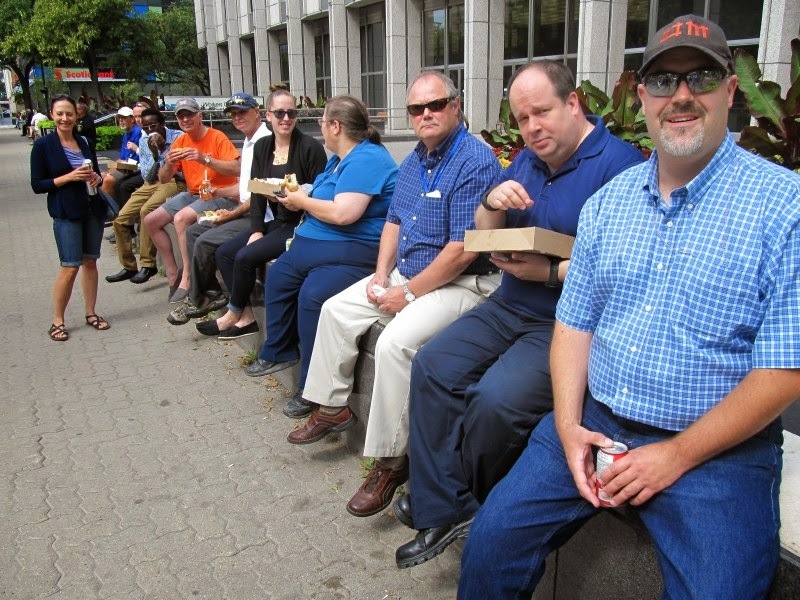 The team of sandwich eating professionals that brought you Winnipeg’s Best Club House, Reuben and Gyro, now embark on a life long quest to find Winnipeg’s best burgers. Yes, burgers – we’re going to rate the best Bacon, Cheese, Chili, Fatboy, Greek and Mushroom burgers. 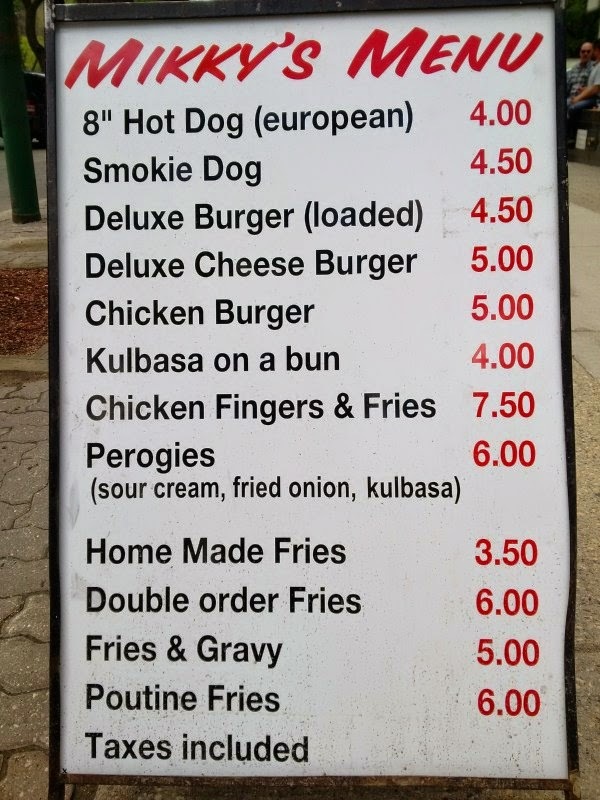 I know what you’re thinking – there are already several lists for Winnipeg’s Best Burger – but we bring the science – we have spreadsheets! 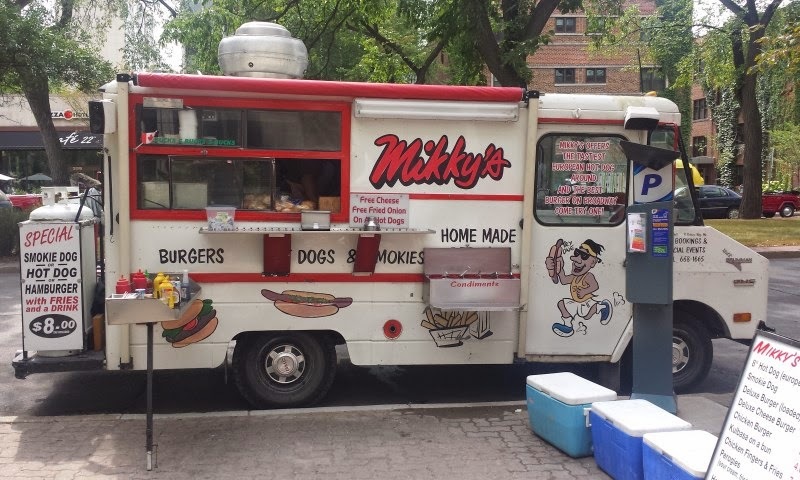 The white and red Mikky’s truck is a veritable institution on Broadway. Twenty-two years ago it belonged to Mikky, somewhere along the way it became Daryl’s, and for the last fifteen years it’s been owned by Don. Originally operating a hot dog cart, Don traded his umbrella for the metal roof of Mikky’s when the opportunity arose. 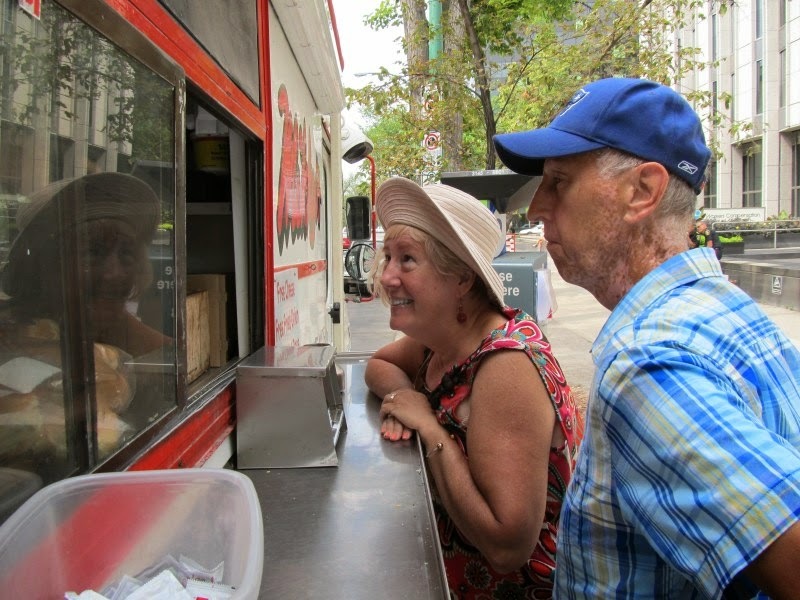 Don seems to have found the formula for success in the very competitive food truck market. 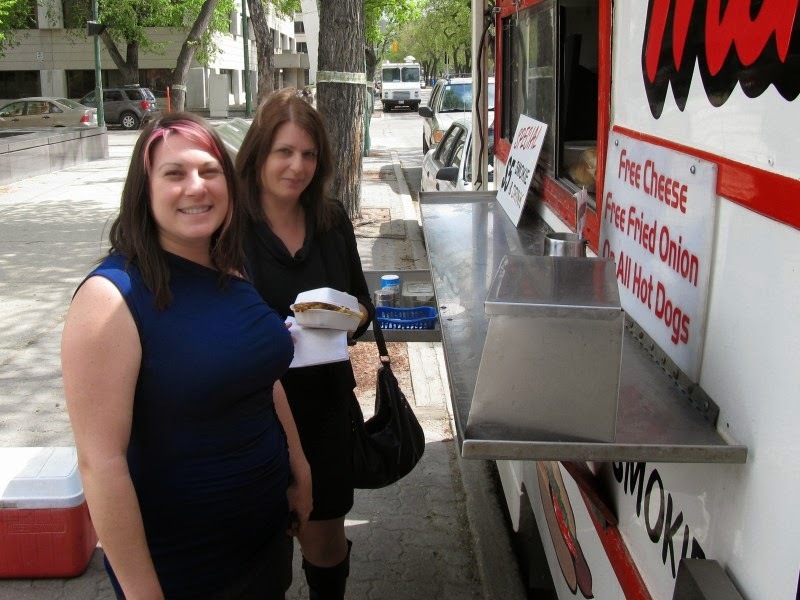 An inexpensive and tasty burger, served quickly, draws lines of people to the Mikky’s order window on sunny lunch hours. 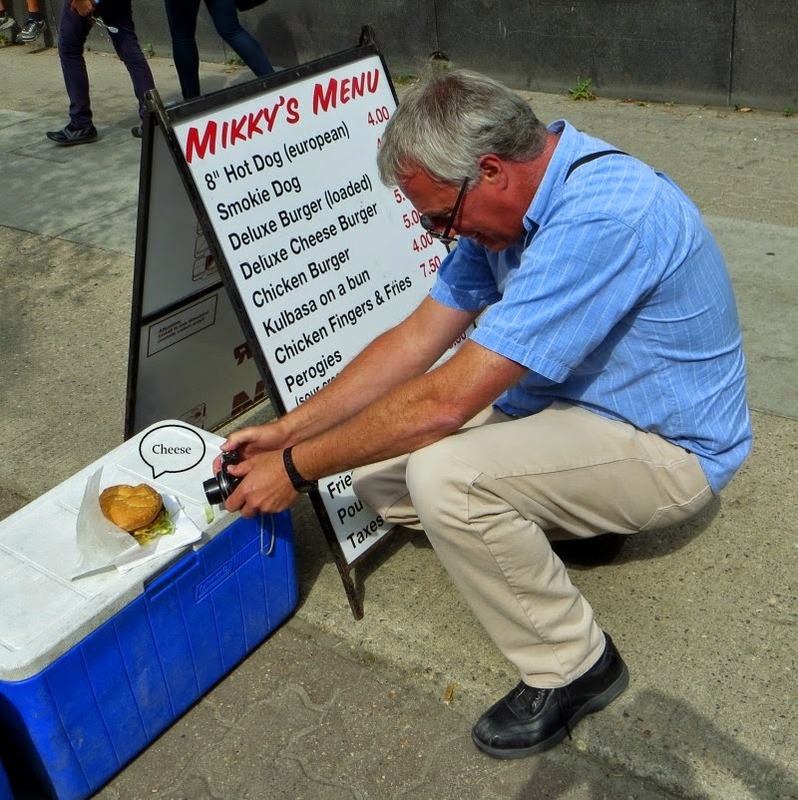 Mikky’s feeds the parking meter in front of the WCB and sets itself apart from other trucks by laying out a line of welcome mats on the low granite wall for diners to settle their office attire wrapped derrieres onto. The nice lady taking orders was all smiles and Don came out to tell stories when there was a break in the lunch rush. The deluxe cheeseburger is only $5, tax included. For $8 you can have fries and a drink with that. 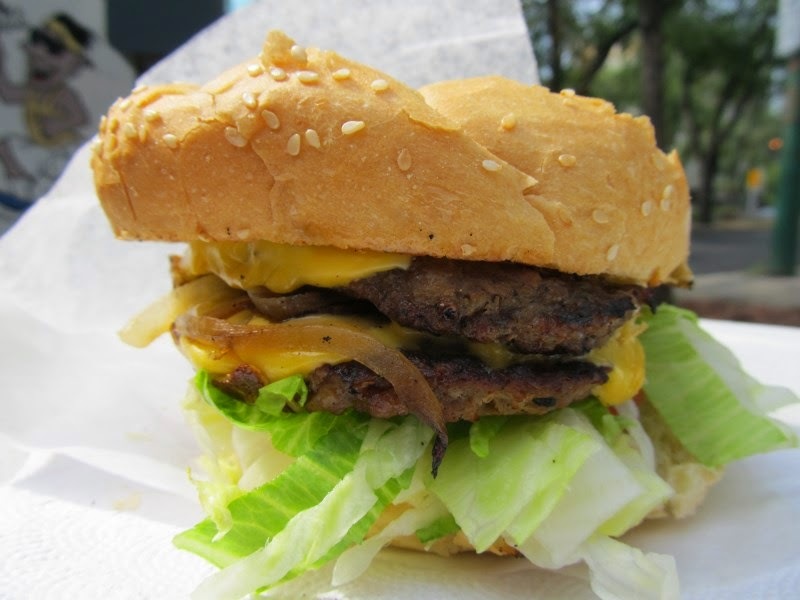 The deluxe burger comes standard with lettuce, tomato, fried onions and pickles. There are a couple of condiment stations hanging off the truck and a row of self serve drink coolers on the sidewalk. The mayo is wisely kept inside so it’s not sitting out in the sun. 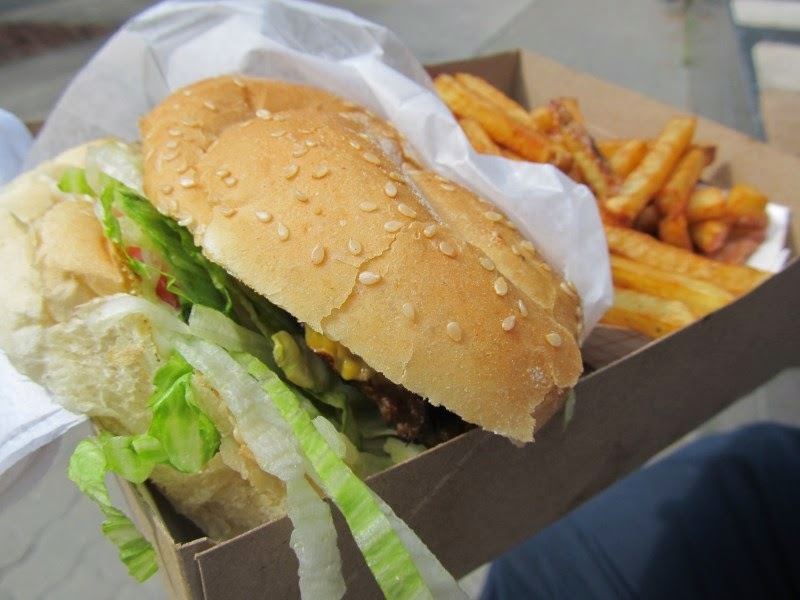 If you have just a burger, it comes nestled in a little wax paper pocket that’s perfect for one handing the burger while containing any fallout. The combo is served in a little cardboard tray that’s quite convenient if you’re sitting and using your lap as a table. 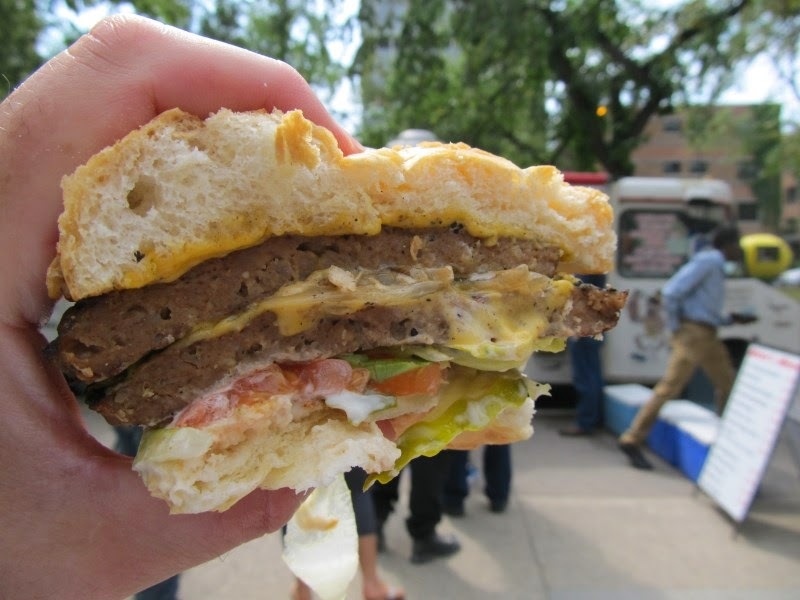 The first thing you notice when you sink your teeth into a Mikky’s burger is the big delicious City Bread bun. There’s plenty of fresh chopped lettuce - if you’re going to have any fallout, it’s going to be the lettuce. The groceries are rounded out with diced ripe tomato and fried onions – a favorite of mine and something you pay extra for at a lot of burger joints. The thin beef patty gets lost in the bun and groceries. The flavour of this burger is in the bread and toppings. The beef is an inexpensive “store” patty that cooks fast and keeps the price down. I've had the single and decided to ask for a double burger today. That brought the burger-to-bun ratio to where it should be, but my double-meat tilted the flavour balance. Don suggested we try the European next time so I guess he’s still a hot dog guy at heart. We’re evaluating burgers as they stand on their own – excluding price, the restaurant experience and the quality of the fries. It’s all about the burger. We rate the sandwich as a “package” using the following attributes: Quality, Flavour, Quantity, Assembly and Presentation. We also use a weighting system with Flavour weighted 3, Quality weighted 2 and each of Quantity, Assembly and Presentation rated 1. Each Burger Club team member completes their own score which is then averaged to come up with a 1 to 5 star rating. The “Best Burger Joint” ratings are weighted by the number of Burger Club reviews received using the Bayesian estimate method. A minimum of six reviews are required for a burger to be rated. The "Hamburger Dress" was created by Joy Kampia. Copyright TurdleEggs. Powered by Blogger.